The two-day event, which will welcome over 100 exhibitors, sponsors and a panel of 30+ leading industry operators, is “dedicated to the business of coffee, tea, soft drinks and related products” as customers become “far more” knowledgeable and demanding. The panel will include representatives from Compass, Costa, Esquires Coffee, Fernandez and Wells, Four Seasons Hotel, John Lewis, Selfridges and Soho House. Annie Swift, European Coffee Expo managing director, said: “With its total focus on coffee, tea, soft drinks and the equipment required to prepare and serve them, the European Coffee Expo is inclusive of the whole market from artisan coffee shops, hotels, pubs, cafes and restaurants to contract caterers, leisure operators, retail and the travel sector – the entire, serious, professional foodservice market. As well as this, there will be sensory workshops; demonstrations; taste sessions and challenges and taster sessions from Specialty Coffee Association’s local Authorized SCA trainers (ASTs) of its Coffee Skills Programme. 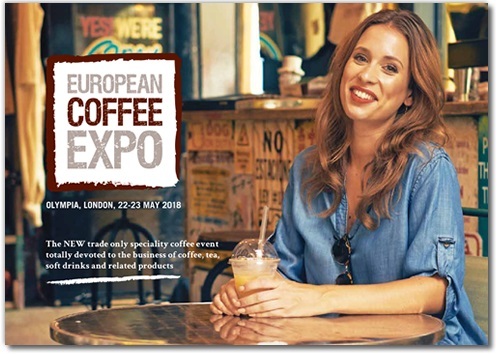 Free to attend, the European Coffee Expo will take place at London’s Olympia from 22-23 May. More information is available via http://www.europeancoffeeexpo.com/.